I am fascinated by song stories...the glimpses of composers' lives that their creations permit us to see, although oftentimes not so readily. Here are my my "scoops", posted here for your enjoyment, and for what I hope will feed our mutual curiosity about His musical purposes for us. Join me in this history adventure, as we find what circumstances coalesced to create the songs we all love! Play detective with me, and tell me what song "scoops" you may know that I don't...yet. Who would have been there to see what he described, and was his narrative dramatic enough? Robert Lowry was imagining how an historic event transpired as he was reading and thinking about Easter in 1874. He had some text to lean upon, but not the exact moments that he wanted in order to memorialize this event with new words and appropriate music in the composition “Low in the Grave He Lay”. Was the 48-year old Lowry’s background in literature useful as he went about this task? 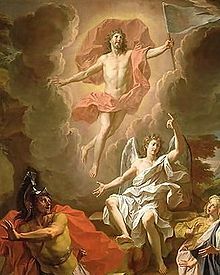 Could he have been inspired by a picture of the resurrection moment (perhaps the Noel Coypel 1700 painting shown here)? Robert Lowry’s hymn in 1874 was the result of several years of education and ministry, both in the pulpit and in music. His musical gift that developed from childhood bore fruit in the 500 hymns and over 20 hymnals that he co-edited by the time of his death in 1899. Much of his pulpit ministry experience had in fact occurred by the time of “Low in the Grave…”. His reputation as a speaker reportedly included a brilliant imagination that held his listeners in rapt attention. In 1874, while he was serving as pastor of a Baptist church in Lewisburg, Pennsylvania, Lowry was also professor of literature at nearby Bucknell University. One Easter season, Lowry’s gifts in mental imagery, musical composition, and writing skill fused, as they undoubtedly did on other occasions, while he studied scripture. Though it’s said that Lowry was stirred by what the angels said to the women who visited Jesus’ tomb on the third day, his poetry suggests he also must have noticed the emotion of the soldiers in Matthew’s account. After all, they may have been the only ones who actually witnessed Jesus emerging from the tomb – an electric moment, to say the least – thus giving us readers an idea of what onlookers might have experienced. Lowry’s hymn reproduces that moment – though, maybe even he might admit he couldn’t do it justice. The hymn he wrote has also been titled “Christ Arose”, an exclamation that better expresses what Lowry was probably feeling than “Low in the Grave He Lay”. What would it have been like to see Jesus come out of the grave? Skeptical historians might conclude that He emerged quietly, since that actual instant is not in fact recorded for us to examine. It was a unique incident – God’s only begotten son, rising – worthy of great fanfare, right? Salvation’s moment, humanity’s liberation. Hard to downplay it, huh? If its description’s absence in the Bible disappoints you, ‘that’s no problem’, Lowry might say. ‘I’ve got your answer’. And, rebirth won’t be just a mental image or a song, someday. I’ll see it for myself. Yeh! Information on the song was obtained from the books “Amazing Grace – 366 Inspiring Hymn Stories for Daily Devotions”, by Kenneth W. Osbeck, 1990, Kregel Publications; and “The Complete Book of Hymns – Inspiring Stories About 600 Hymns and Praise Songs”, by William J. and Ardythe Petersen, 2006, Tyndale House Publishers, Inc.